OneNote has many uses, but some people shy away from using it as a personal or business planner because of the labor required to create all the necessary pages. You are about to read about two options for creating a daily planner for OneNote that can change the program into a time management asset quickly and easily. In just a few minutes OneNote and one of these tools can change your life forever. 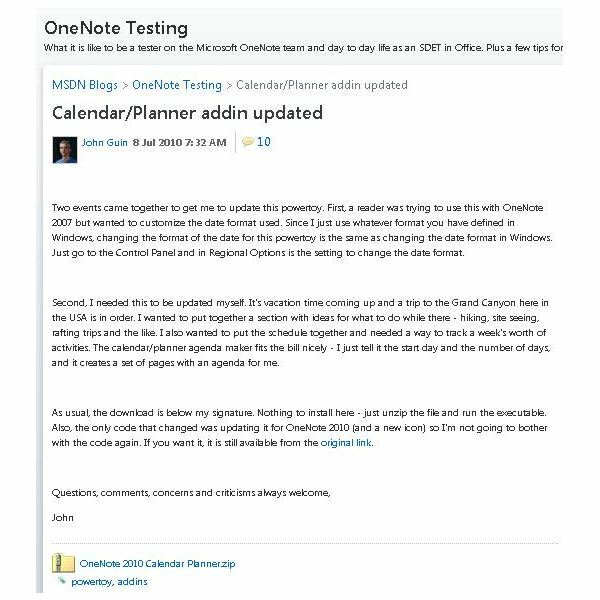 One of the best options for a daily planner for OneNote users is the OneNote Time Planner by Dean Gardiner. This is a template made available as a free download by its creator. After downloading and extracting the zip file containing the template, double click on the "TimePlannerTemplate.onepkg" file in Windows Explorer to open the template in OneNote. When the "Unpack Notebook" window appears, define the desired location for the template or accept the default location and then click the "Create" button. A planner notebook opens with helpful instructions on its use. If you can, take some time to do a couple house cleaning tasks before jumping in to use the daily planner. First, browse to your notebooks folder and then make a copy of the notebook that was just installed. Browse to C:\Users\[User Name]\Documents\OneNote Notebooks\TimePlannerTemplate\Step 5 – Daily Planning and then copy the "Year 20xx" folder. This will allow you to preserve the generic notebook section for use in future years. When this is done, open the time planner notebook and then right click on the Year 20xx – Copy and then rename it for the current year. The other bit of housekeeping is to rearrange the month sections into their chronological order. By default, OneNote sorts these sections alphabetically which is not very convenient. Because this template includes a daily planner plus a whole framework for implementing a "getting things done" system to get your entire life in order. Of course, if you only want to use the planner part of the template, you can feel free to delete the extra sections. 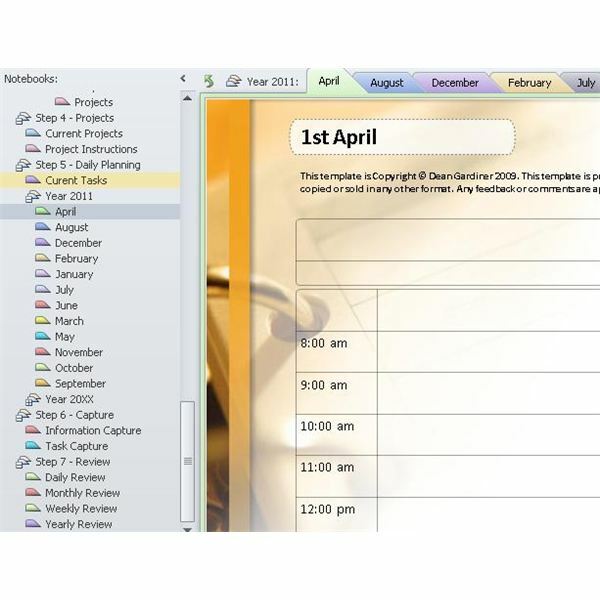 The Calendar Powertoy for OneNote 2010 or OneNote 2007 for OneNote by John Guin is a great choice if you want to quickly and easily create your own daily planner. 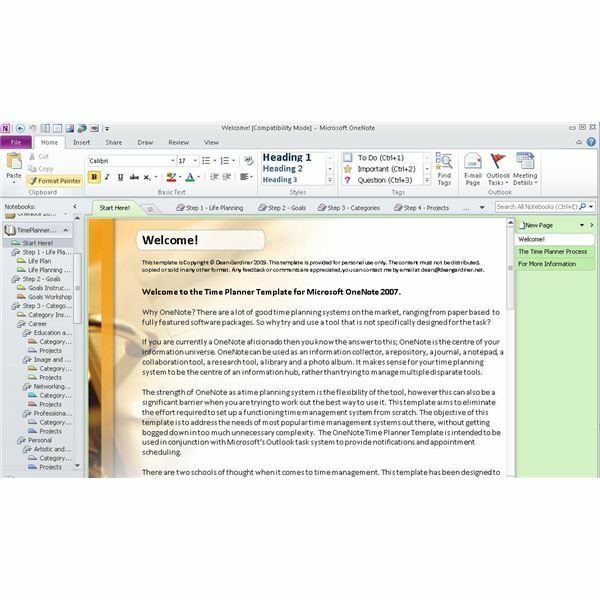 This utility is a standalone application with separate versions for the 2007 and 2010 versions of OneNote. Download this planner from the provided link and then unzip it to a folder on your computer. You should now have a program file called "OneNote Calendar.exe." Double-click this file to open the calendar/planner utility. 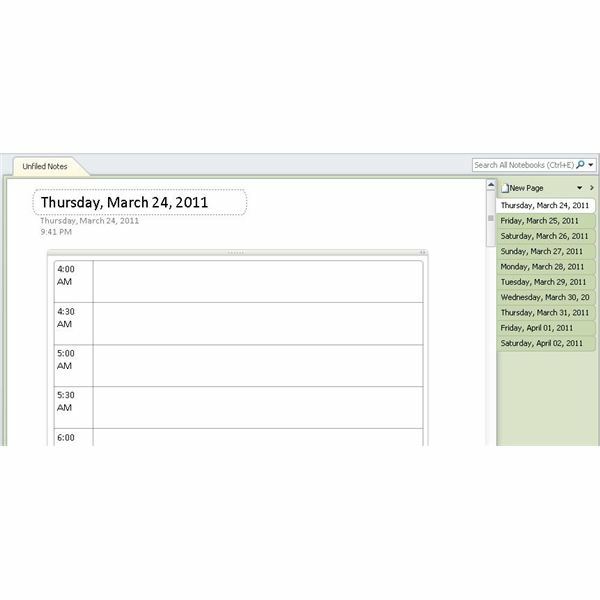 When the "Calendar Page Maker" window opens, select a notebook where you want to insert your planner and then choose your start date and number of days for your your planner. Also, if you want to have space provided for your daily agenda, be sure to check the "Add Agenda" check box and then define the hours for your planner and the increments you wish to use. When all the settings are finished, click the "Make Calendar" button at the bottom of the window. Please note that on some installations, this utility may only work when the "Unfiled Notes" section is selected. When the utility is finished creating the planner pages you requested, click the "OK" button. Now, open the destination section and fill out your planner! If you had to create your pages under the "Unfiled Notes" section of OneNote, you can now move them to a section of your choice. You have just seen two great solutions for creating a daily planner for OneNote. 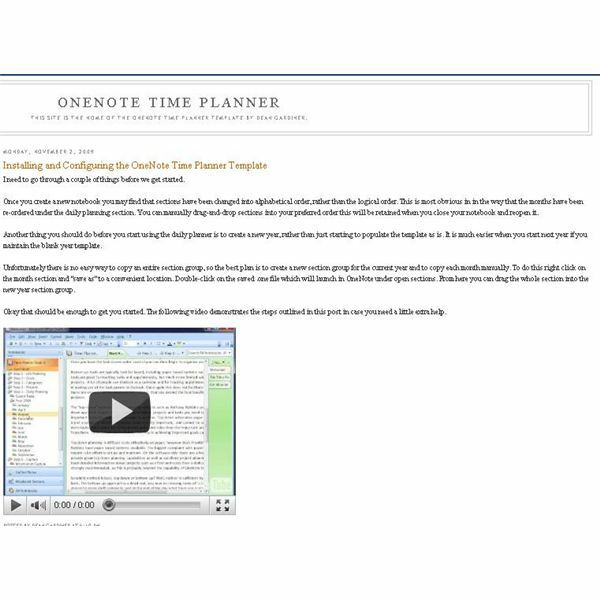 The OneNote Time Planner is a great choice for you if you want to plan your entire life as well as your days. The Calendar/Planner Powertoy is perfect for use with either short term or long term planning efforts without any unnecessary overhead. Download and try both of these solutions. After all, you may find a way to use both as you work to manage your time.